Have you had your biscuit today? Biscuit: In the UK, your biscuit might be topped with chocolate or have currants in it. You might dip it in your cup of tea, or have one as a snack after lunch. If you were in the US, you might put bacon and eggs on it or smother it in gravy and have it for breakfast. Or you might put a piece of chicken on it and have it for dinner. How did these two very different meanings come to be? According to the Oxford English Dictionary, the word biscuit comes originally from the Latin biscotum (panem), which means bread “twice baked,” which would explain the hard, crunchy quality of a British biscuit. An American biscuit is similar to what the Brits would call a scone (and an American scone is something else entirely). It’s unclear how these two different foods came to have the same word, and we can only speculate about the influence of the French language in the southern United States. Cookie: The word cookie opens up a whole other can of worms. In the UK, a cookie is a soft, squishy, moist biscuit, for lack of a better word. British cookies tend to be bigger and more substantial than a British biscuit. In the US, a cookie covers both what the British would call a biscuit and a cookie. The word comes from the Dutch koekje, meaning “little cake,” and could have been popularized in the US through the early Dutch colonization, though we don’t know for sure. So, a British biscuit is an American cookie and an American cookie is a British cookie and an American biscuit is a British scone and an American scone is something else entirely. Simple! Now that you have mastered all of that, allow me to continue. While watching the made for television movie Death Comes To Pemberley, I noticed that when Mrs. Reynolds was showing Mrs. Darcy what food was to be served at the ball, she mentioned “Prince of Wales” biscuits. I thought nothing of it, for who has not heard of foods named after kings, queens and even celebrities. 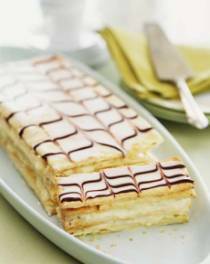 Anyone care for a slice of Napoleon? Below is a picture of Prince of Wales Biscuits and the recipe. 1 lb butter and 3lb 8ozs of flour. To be mixed the same as hollow biscuits; and to be stamped with the prince’s feather; they must be pricked with a fork; and baked in rather a slower oven. From Joseph Bell, A Treatise of Confectionery (Newcastle upon Tyne: 1817). above the back entrance to the prince’s kitchen wing at Brighton Pavilion. 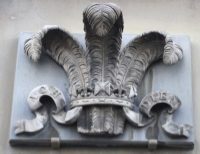 This emblem was the motif printed on the Prince of Wales biscuits. York Biscuits were invented to commemorate the marriage of the Duke to Princess Frederica Charlotte of Prussia in 1790 and continued to be made well into the twentieth century. A picture of a boxwood York stamp is included below. 1 lb butter, 8 oz. of sugar, 3 lb of flour. Rub the butter into the flour; then add the sugar, and mix it up into a stiff paste with milk; rolle the paste out about a quarter of an inch thick, they must be cut square and stamped with a proper stamp of the happy union and baked in a good oven. From Joseph Bell, A Treatise of Confectionery (Newcastle upon Tyne: 1817). the Duke of York and the Duke of Clarence. 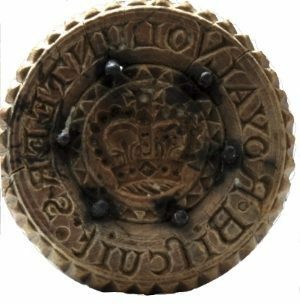 It is carved with a royal crown and engraved with the words Royal Volunteers Biscuit. The use of the long s, rather like an f, dates this print prior to 1810. Volunteer militias were raised throughout Britain during the Napoleonic Wars, and perhaps these biscuits were enjoyed in the officers’ mess with a glass of wine. The pictures below depict the biscuit making process. First, the dough is rolled out and cut into strips using the rolling pin as a ruler. The other illustrates how the biscuit prints or stamps were used. In addition to stamps, every kitchen drawer in the Regency period also housed a docker, which was a device for punching tiny holes into the biscuits to stop them from bubbling up. Many of the biscuit prints, like those discussed above, also incorporated their own little docking nails to combine the two steps. The biscuit in the centre has not been docked correctly and has blown up into a bubble. It will, therefore, easily flake and fragment, making it no good for keeping (but great for eating right away!). This is just the kind of information I love to discover in my research. If you have time, be sure to check out the Food History Jottings blog at the link below. It may inspire you to do some biscuit/cookie baking of your own. Now, I leave you with a picture from this blog showing a large selection of biscuits and a giveaway. In the foreground are millefruit biscuits, sweetmeat biscuits, filbert biscuits and rolled wafers. 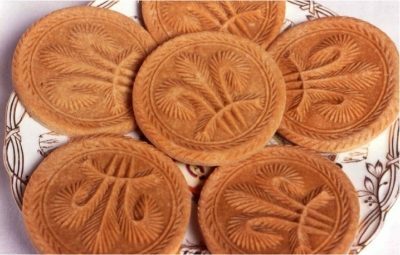 The round biscuits on the plate in the middle printed with the feathers emblem are Prince of Wales biscuits. In the background can be seen some spice biscuits and more rolled wafers. of THE LITTLE BOOK OF SCONES from Grace Hall and Liam D’Arcy. I chose this book instead of a book on biscuits, simply because I like the author’s name! Just comment before midnight Saturday to be in the drawing to win a copy. 51 Responses to Have you had your biscuit today? Thank you for this article! I was watching Death Comes to Pemberly for the 3rd time and I wanted to know what the biscuits Mrs. Reynolds was talking about. I especially appreciate the recipes as I have been a long time cook but am just getting involved in baking and ice cream making! I have 3 cookie presses which came with a hole on one side so as to enable the owner to hang on the wall between uses. Liked reading of all the traditional recipes and designs. Don’t bake as much now that my “kids” moved out. Catching up with the posts I missed while we were away. Yours was so yummy. Never knew quite so much about biscuits and cookies. Thanks! Nice post! Now I’m hungry! 🙂 I know the feeling, Rose! I was hungry the whole time I was writing this. Really interesting. Thank you for sharing. Thank you for reading and commenting, Deb! You’re always teaching me something I didn’t know. This was really fascinating. My mom had several antique cookie presses when I was growing up, but we never used them. Now I understand better how they were used. So sweet of you to say Rebecca. I would love to seen a real cookie press for undoubtedly they are from another era of making cookies, if not as old as regency. Like you, I had no idea what they were until I read this information. Thanks for taking time to comment. How neat. Food used to really have meaning and was interesting along with tasty. Not so much anymore with the invention of the microwave and the big mac. Thanks for the giveaway. You are so right about food having meaning and it was so important to social events (I can hear Mrs. Bennet saying ‘come for dinner; we will have at least 4 courses! or some such thing.) 🙂 Nowadays we eat so fast that it hardly matters what we put in our mouths. heh heh I wish you luck in the giveaway. Very informative! Your post gave me some answers that I’d been meaning to learn more about. Nice to know I have helped someone else Betty. 🙂 I love to learn as much about Regency as possible and it is fun to share it with others who are just as interested. Thank you for commenting. Hi Brenda, What a lovely post. This was so much fun to read. One of my favorite delicacies is clotted cream with or without the scones. I don’t have a sweet tooth and so the unsweetened cream is heavenly for me. Thank you so much for this fun read. That Prince of Wales biscuit sounds awfully plain – flour and butter, no sugar or salt – almost like a pie crust. The Duchess of York’s biscuits sound more like our shortbread, and I’d happily eat that. Thanks for the post, Brenda! Hi Brenda, I knew about the difference between biscuits and cookies, and the others. I still would like to know what a Digestive is! And regarding Ceri’s post – I grew up eating cream cheese and jelly sandwiches, which sound an awful like clotted cream and jam, so I suppose that must be where the idea came from. Please do not include me in the drawing for the giveaway. Sadly, the book would be wasted on me. A digestive biscuit is just a variety of biscuit, I believe they are very similar to your Graham cracker. Now THAT I have never heard of before, Ceri. Thanks for answering the question. Can you also explain what crackers are in the UK? Are they still called crackers and do they correspond to American crackers? Hi Brenda, yes, we have crackers. You’d usually have them with cheese. I should think the most usual ones would be cream crackers, water biscuits and Ritz crackers. I will just google to see what they are similar to over the pond… apparently a cream cracker is like a ‘matzo’, whatever that is, LOL. Cream crackers have been around since late 1800s. Cream crackers aren’t creamy at all, they are dry and flaky and if you have them with nothing on them soon your mouth will be dry and you’re spitting crumbs! They are fine with cheese though, or even better, cheese spread. Similar are water biscuits which apparently are the same as your ‘table water biscuits’. I prefer a Ritz cracker with cheese myself, which apparently are American, from the 1930s. Ceri, your description of Cream crackers sounds like what we call Saltine crackers. Very dry and you can choke on them with nothing to drink. Love Ritz crackers too. Matzo is a Jewish food (not familiar to me) and I have no idea what ‘our table water biscuits’ are unless it means the crackers on every table (which are variations of Saltines). 🙂 Ah, so many different choices! Thanks for weighing in on this topic. I have learned even more about biscuits/crackers/cookies than I shall be well prepared for future stories. Then you were way ahead of me, Ginna, for I had no idea. I like cream cheese and jelly sandwiches too. I don’t know, but I have to think the idea was the ‘other way around’ and cc and jelly was substituted for clotted cream and jam that immigrants might have missed when they came to America. 🙂 I do appreciate your taking time to comment even though you don’t need the book. It means a lot when people take the time to give us their thoughts on the posts here. When I was a on a semester abroad in London, I ordered grilled cheese and a cookie. The waitress stared at me and then said, “one toasted cheese and a biscuit”! Thank you for the fascinating article, and I, too, would have chosen the same book because of the author. I like you books, Brenda. Please keep them coming! Thank you for the giveaway. I can just imagine how impatient they may get with Americans in the UK, when it comes to ordering food. 🙂 You are welcome and I am glad you liked my choice of books. Anyone named D’Arcy has to be a wonderful person! Best of luck in the drawing. Yes, you have made me hungry. Trying not to think too much about cookies, biscuits, scones and such. I may have to hold an unscheduled tea party to get this post out of my system! I know your pain, Diana. Every time I read it for mistakes I got hungry. Then when I found the recipe for American scones that I put in one of my answers here, I determined that I just had to make them. Sigh. Maybe I can do like I usually do with foods I love, freeze most of them and eat them over a period of time. However, my husband does love to eat cookies (scones?) so that may not be necessary. Thanks for taking time to comment. So where do crackers stand ? The docked biscuits look like round soda crackers. Way too confusing! If not for you Jennifer, I would never have found this site. So thank you! I shall try to have the biscuits done by the time you get here! I find scones and cream to be my favorite treat in England. It’s difficult to find the Devonshire cream in most parts of the US, although I finally found some for a potluck luncheon the Iowa JASNA Chapter held earlier this year. Oh, so delicious with homemade scones and fruit. Where did I find it you ask? On Amazon, of course. And if you elect to order some, compare the prices and shipping. I found one site offered nearly three jars for a pittance more than others did for one, in which instance the shipping was more than the single jar. One other tip: While the recommendation is against freezing because it separates much as whipping cream will, the expiration date of several days hence is meaningless if the cream is stored in a very cold part of the refrigerator. I opened a bottle that was at least two months past just recently, and it was fine. I look at the date as meaning once it’s opened, one must nibble throughout the day or two on scones and cream, lest the cream should otherwise happen to go bad. I would certainly like to win this recipe book. Oh Betty, thank you for sharing how to find clotted cream! I shall certainly try Amazon if I can’t find it in a store around here. I fear my little area of the world is not “clotted cream” friendly. Heh heh I wish you luck on the drawing! Glad you found it as fascinating as I did Carmalee. I posted a link to what an American scone was in another answer. It made me want to make them! Thanks for a very interesting article. I made my first scones last spring when we held a tea party at my church. They were enjoyed by all. My grandmother used to make a large, puffy ‘cookie’ for lack of a better word, which she called a scone. It was really more of a sweet biscuit in my estimation but I remember that it tasted so good. Thank you for more British vs American differences, Vesper. I shall add them to my list and TRY to remember them! 🙂 I knew cream cheese was not the same for I had seen pictures of clotted cream, but I had no idea WHAT clotted cream was! It looks yummy though. I love them, too! I hope you win a book and make those scones! Oh Brenda, what an interesting post, though I am left wondering what on earth an American scone is. Usually here biscuits are crunchy and cookies are soft, like you say, although I think cookies might be a fairly recent import from you guys. I need a stamp for biscuits, they look so good! I am happy you found it so, Ceri. I thought of explaining the America scone but did not want to get off the subject of biscuits. Here’s a link (hope it works) to a very short explanation and recipe. I hope it works. http://www.nytimes.com/2014/02/26/dining/biscuits-and-scones-share-tender-secrets.html?_r=0 and thanks for the description of clotted cream and what to put on the scone first! We American’s need ALL the help we can get! I loved this. I knew some of the differences but the fun is in the details. Panera Bread makes lovely mini scones that look like the ones you get when you go to a tea room. I get lemon curd and clotted cream from the grocery and can create my own tea moment. The details of what is what are fascinating. ? Isn’t it fun to learn the details, Kathy. I shall have to try Panera Bread’s mini scones for I had no idea they had them. I know I have seen the lemon curd in the grocery and if I can just find the clotted cream, I shall be set! (like I really need the calories! heh heh). Thank you for taking time to comment. Interesting article.. I thought when reading novels that they sure like biscuits much more than us in the US. Now I know they like sweeter things like us. Who doesn’t love a cookie, or two or three at a time. I knew they ate scones with clotted cream and jam. I am not sure however, what clotted cream really is made of or how it is used. Is it anything like our cream cheese? I do however like scones but not the plain ones as well as the ones with bits of dried fruit in them. They seem to eat fruit tarts in many instances in the novels I have read. Thank you for the interesting view of the differences and the recipes as well. I am glad that you thought it interesting too, MaryAnn. Like you, when I began to read JAFF stories I wondered why the ate biscuits all day long! 🙂 I have always wanted to try clotted cream and jam too, for it sounds yummy. I am guilty, also, of putting fruit tarts in my stories. “smiles” Thanks so much for taking time to comment.